Mali Mish - Day 130: Heading down to the Keys. Today we are saying good-bye to our friends and our courtesy parking spot in Boca Raton. Little Ethan likes to call Ava and Mila “his girls” and Luka gets the label “chubby baby”, which is so on the money. Haha. But before we part ways, Mila needs to go to timeout for a few minutes on the floor of someone else’s driveway. We have no shame. Yes, we post smiley pictures for the most part but the kids act up too. Hugs and smiles between the girls can quickly can turn into bickering and tattling. We try to show the girls how to be kind to each other but when you mix in the heat, bug bites and close quarters, life can’t always be dandy. 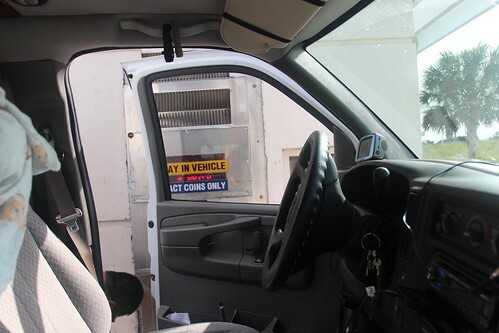 As soon as we hit the freeway, we got hit up with tolls. Tolls, tolls, tolls. We had to pay less than a dollar to get on the freeway itself. Where did Dan go? He dropped a quarter on the ground and he found someone else’s dime. But a big difference from our last trip thru Florida in 2010 is that instead of stopping a every so often to pay more tolls, now they take pictures of our license plate and send us a bill. Most of them didn’t give people the options to pay via the traditional way and when they use the photo toll, an extra ‘service fee’ is automatically added. I’m not sure if I would call it a ‘service fee’, it’s called a rate increase. Well, thank you so much, Florida!! 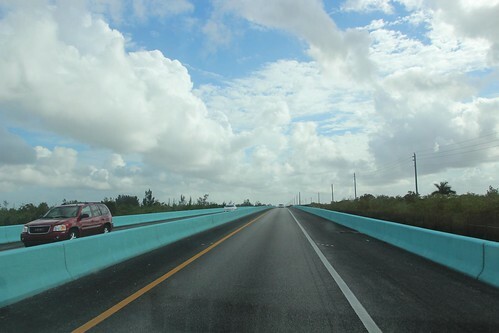 The second you start entering the Keys, the turquoise walls appear. It is so nice to see them at the start of the drive, like an old friend. 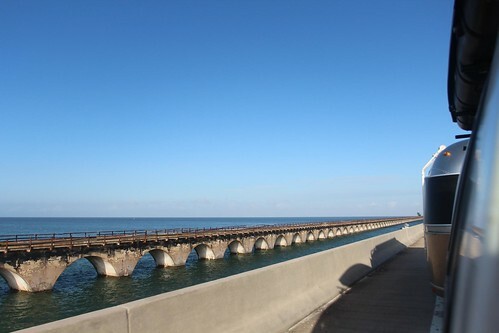 The turquoise walls eventually disappear and they you get to see the ocean on both sides as your cross bridge after bridge… and the cool railroad bridge that is no longer in service. You will see fishermen hanging out with their poles and some hungry pelicans waiting for free meals, too. 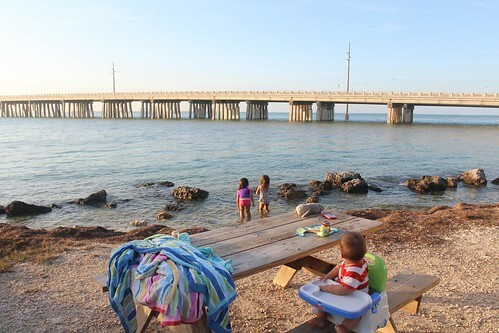 Our stop in the Florida Keys is the campground at Bahia Honda State Park. We’ve never stayed here so we were really excited to get to our spot. 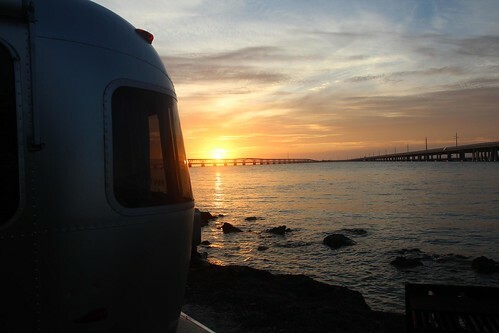 As soon as Dan backed the Airstream into our waterfront spot, I knew this place was going to be just what we were looking for. A that was a change of pace. We were going to slow down a bit for the holidays. 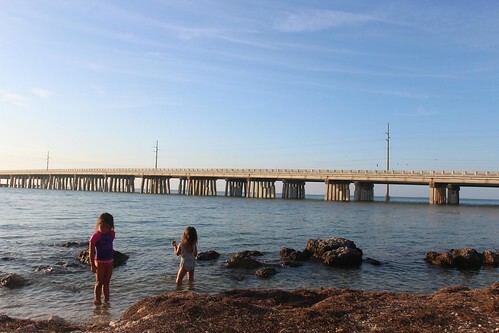 The girls immediately asked to change into their bathing suits and play in the water that is, technically speaking, the Gulf of Mexico. 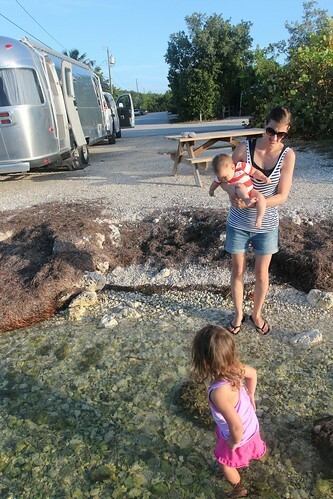 I was also excited to be able to have the girls so close to the Airstream so I could actually get stuff done on dry land a few feet away. Like feed this hungry little man. 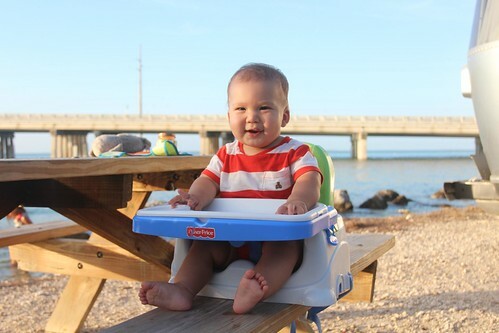 Oops, I mean chubby baby. A few minutes into our “perfect” afternoon, we noticed that something was not right. Ouch we all screamed. I guess all the sand gnats from the seaweed were attacking us and then the large mosquitoes made themselves known too. Run away! 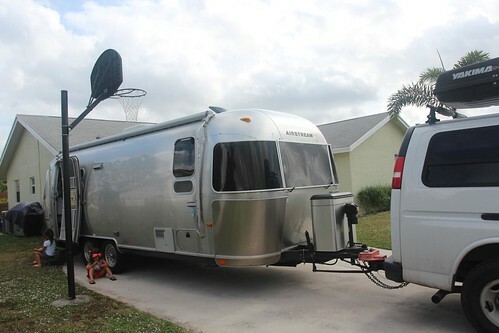 So instead of enjoying our time with the windows open, we shut them and had barricaded ourselves inside the Airstream for the rest of the evening. 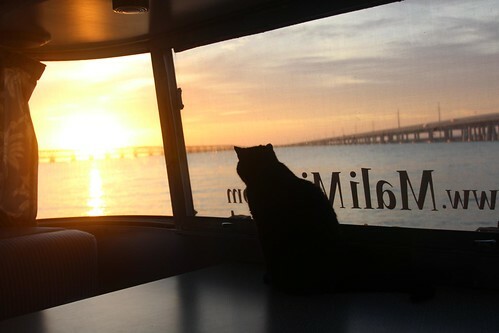 I guess we will be enjoying the sunset tonight next to Yoda the cat. Since the kids spent all morning playing with their friend, we pushed off homeschooling until the evening. I love the flexibility of homeschooling. 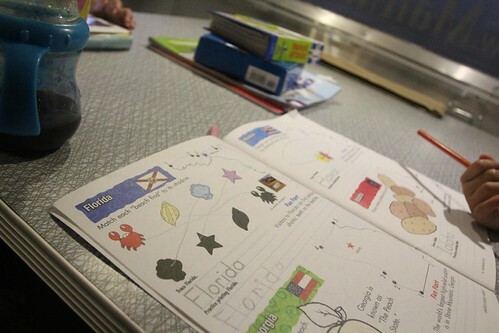 Ava got to catch up on her United States workbook. Florida is the 17th state she has been in on this current trip. We also focused on measuring things today. Ava really got into this activity and Mila joined in like the excited copy cat that she is. The girls measured everyone’s height with pencils. 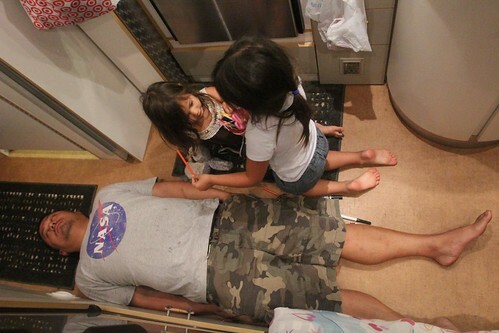 Ummm Dan, this is not nap time. You can open your eyes! 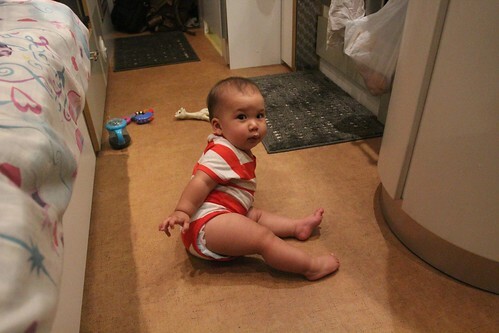 And look who just pushed himself up from his crawl stance. Oh no boys and girls, this looks like t-r-o-u-b-l-e. Good thing all of the drawers in the trailer are already baby-proofed so they don’t open while the trailer is in motion. 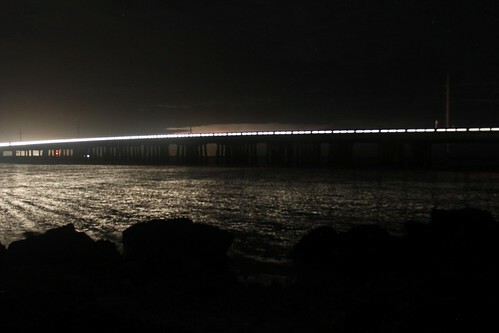 And with a view of the Overseas Highway and a lightning storm in the distance, we say good night…. don’t let the damn bugs bite.